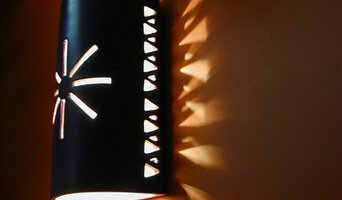 Matthew and Karine Maynard are designers, blacksmiths and artists who use metal and architectural space as their media. As a husband and wife team, they specialize in hand-forged custom stair balustrades (railings), furniture and applied design. Their work has been featured internationally & given prominence by the National Ornamental Misc. Metals Association and the Artist Blacksmiths Association of North America. 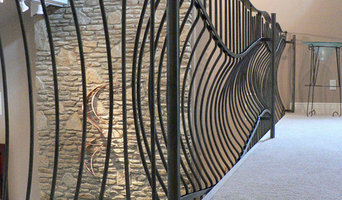 They continue to win international competitions with their hand forged interior stair railings and the duo's work leads in contemporary blacksmithing design today. They have also earned the highest acclamations of the Kentucky Arts Council, with support from the National Endowment for the Arts. Their large commissions are primarily installed in private residences from California to Italy. Each element of their work reflects their professional attention to aesthetic detail, design and function with a focus on quality over quantity. "We work closely with our clients throughout the design process and look forward to collaborating with them and creating something that will last for generations to come". 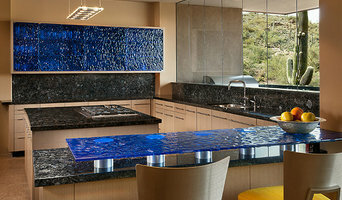 Meltdown Glass Art & Design is a manufacturer of specialty kiln-fired art glass for architecture, interiors, and fine art. We excel in numerous applications ranging from entry doors, partitions, water features, shower enclosures, countertops, kitchen backsplashes, and more. Faux Finishing, Decorative, and Interior Painting and Murals for residential and commercial spaces. We have just expanded into South Carolina, and have served New Jersey, NYC, CT for over 15 years. 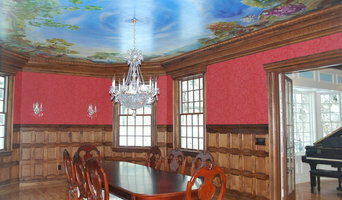 Stacey Guggenheim has been working for over 15 years as a faux finisher and muralist specializing in venetian plaster, lime plaster, custom painted murals, woodgraining, antiquing, Children's murals, and custom murals and paintings on canvas (framed and unframed to later be applied on site like wallpaper.) We reside in Monmouth County NJ and service all areas of Monmouth County including Red Bank, Rumson, Fair Haven, Little Silver, Monmouth Beach, Oceanport, Holmdel, Lincroft, Colt's Neck, Marlboro, Manalapan, Freehold, Millstone, Atlantic Highlands, Allenhurst, Deal as well as other areas of New Jersey. Please call for a complimentary consultation within these areas. As a painter and a muralist my entire life, I am extremely passionate about making a house a "home" and truly love helping others realize their vision for their own home. I enjoy getting to know my clients, understanding their lifestyle and sensibilities and creating an environment that truly reflect their personality. SG Decorative Painting and Murals can create a faux finish or mural that suites you perfectly. SG Decorative Painting and Murals of NJ "making homes beautiful one at a time"
Instant vertical gardens that bring light and life to any space, Aerwal is as easy to install as a picture frame and easier to maintain than typical house plants. We are a pair of designers that build standard Aerwal vertical gardens and custom installations for commercial or large residential projects. Artist painting beautiful things to make the world stop for a moment and appreciate the things in life that bring joy or mystery. That's what I hope I'm doing at least. I'm an artist and painting is my business. I love to paint little creatures like birds wearing hats and flowers from far away places. Sometimes I make those places up. Trees with gnarly branches and beautiful forms along with tropical plants are a favorite subject. I also enjoy painting the strange and unusual... abstracts and more. Mystery, fantasy and folklore, astrology and nature... these are all things that intrigue me and inspire me to paint. All these little mysteries of life I find so compelling that I must share what I see with the world in the form of my art. My paintings are for sale on my website and I occasionally take commission work if I find it curious. Architectural photographs should draw the viewer into the space viscerally and immediately, evoking the feel intended by the designer. The perceived influence of the photographer should be very subtle. I provide the best photographs to meet your needs while working within your budget – from the creation of publication ready images of your latest portfolio project to a fast handheld shoot documenting a small job. Our company produces high quality fiberglass fish and marine animal replicas. These replicas instantly add a naturalistic touch to any nautical or coastal themed interior design. Our customers include interior designers, home owners, museums, restaurant owners and marine related businesses looking for interior decor. Some of our clients include Bass Pro Shops, Jimmy Buffet's Margaritaville, Ralph Lauren, Disney, Houston Museum of Science, National Geographic & Brooks Brothers. 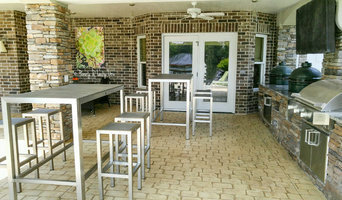 I am a fine artist that sells fine art and is hired by contractors designers and architects to do unique projects that require an Artist.